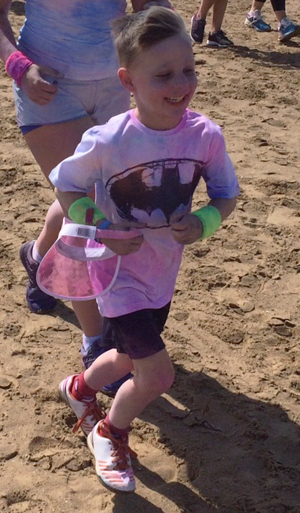 6 year old Josh took part in The Colour Run along with his dad Jamie and his aunty Emma. This was his first charity event to raise money for MS Trust and as his aunty Emma tells us below, his family were very proud. We are so proud of Josh as he didn’t stop running once. The sun was shining and we ran 5K on the soft sand with coloured powder being thrown at us every kilometre of the run! Josh never met his great nan, but he knows that I raise money in my nan’s memory and he wanted to be a part of this. At the end of the run he asked "Did I run fast enough to help other people that have MS like ‘old nanny’ did (as he refers to her!)? Will the money be able to help them?" So it’s sweet to know that he knew why he was doing it and his eagerness to help others was really heart-warming. Josh is very excited and looking forward to the next challenge now and he is already racking his brains for more fundraising ideas. In total he raised £145, smashing his target of £50 by 290%!